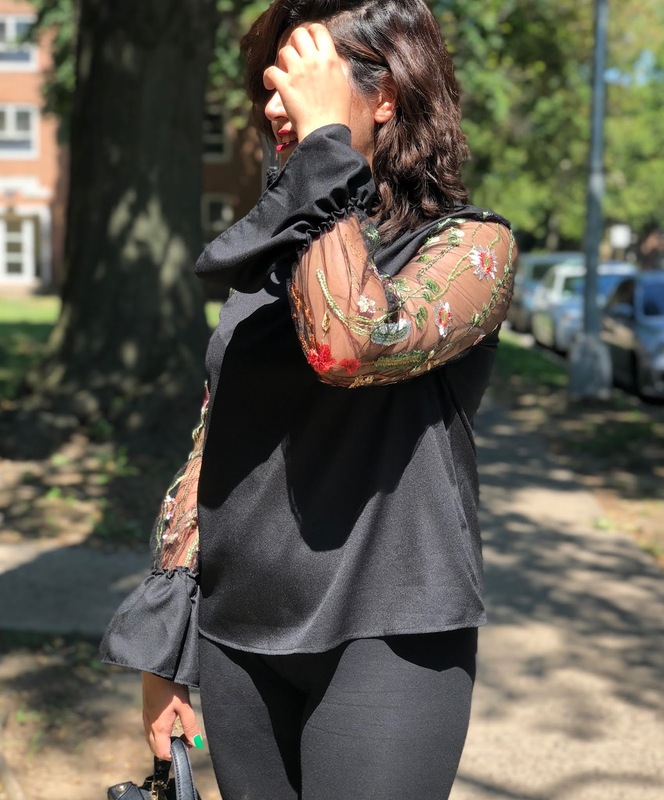 Hey everyone, today's outfit features this stunning Flared Sleeve Blouse which I recently got from Wholesale7. I just love these lace sleeves and the added floral embroidery on them make this blouse look more classy. I also love the satin silk-like appearance of this blouse. And no doubt it is really comfortable to wear as well. And how can I not mention the V-neck and the choker neck details? They make this blouse look extra chic. I paired this top with my basic black leggings that I got from Forever21. And to make this whole outfit more interesting, I decided to pair it with my red suede heels. Aren't they just gorgeous? lovely shoes dear. The almost all black styling looks really gorgeous. I love the mini flare sleeves. Your hair so beautiful, and that cute bag is a must have. Love the details on your top.